I found a coupon for these in a magazine a while back and decided to give them a try. Boy am I glad that I did! They are absolutely delicious. I got the BBQ flavor and I actually like them better than Baked BBQ Lays. They're about the same amount of points. It's 3 points for 19 chips. They are airy and crunchy and full of delicious BBQ flavor. They're popped, not baked. Price wise, they were a little on the expensive side. I would definitely buy them again if I found them on sale or had a coupon. The bag has 3 servings, so it doesn't last too long. I just love these and can't wait to try the other flavors! 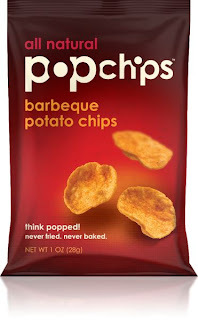 I really enjoyed Popchips. I agree they are a bit expensive but I like them and even better when they are on sale.